For some people, when they think of a macrophage, they will imagine a real life microscopic version of Pac-Man running around their body ingesting any microbial intruder lying in its way. While this has been the central dogma surrounding this immune cell for the last 100 years - it is becoming increasingly more obvious that this isn’t the entire truth. Within the last 10 years, numerous papers have been published identifying new functions and processes carried out by the humble macrophage. More importantly, we have shown that tissue resident macrophages carry out organ-specific functions. For instance, macrophages have been shown to contribute to iron recycling in the spleen and liver (Theurl et al. 2016), thermogenesis regulation in adipose tissue (Nguyen et al. 2011) and more recently, electrical conduction in the heart (Hulsmans et al. 2017). Are you trying to tell me that these tiny white blood cells are better at multitasking than I am? Well….Yes. That is exactly what I am telling you. A study published in Cell by a team of researchers from Harvard Medical School, revealed that cardiac-resident macrophages play an important role in facilitating electrical conduction in the steady state heart. By coupling cardiac research techniques such as surface and telemetric ECG monitoring with immunological techniques like flow cytometry and the use of transgenic mice, they uncovered the secret life of a cardiac macrophage. Cardiomyocytes, or heart cells, communicate with one another via gap junctions. Gap junctions allow for the transmission of small molecules and ions between neighbouring cells, which in the case of the heart, facilitates the synchronous contraction of the tissue and subsequent generation of a heartbeat. Connexin (Cx) proteins are the nuts and bolts of these intercellular channels and can come in various isoforms. The particular isoform Cx43, has been shown to connect cardiomyocytes with non-cardiomyocytes. Using Flow cytometry and RNA sequencing, the team were able to show that AV node resident macrophages express Cx43. To prove that the macrophages were using the Cx43 connexin proteins to form gap junctions with neighbouring cardiac cells, they took a closer look at the cells using electron microscopy. This allowed the team to visualize direct membrane-membrane contact between the two cell types, indicating possible cell-cell communication. To investigate whether cell-cell communication was happening through the Cx43-junctions, the team used a loss-of-function experiment where they deleted Cx43 in AV node resident macrophages. To do this, they used a tamoxifen inducible system, where by injecting the transgenic mice with tamoxifen, they could specifically delete Cx43 in the cardiac macrophages. 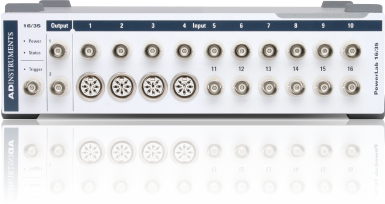 To measure the effects of removing the Cx43 junctions on AV node conduction, they performed an in vivo electrophysiology (EP) study using a Millar Mikro-Tip octapolar catheter (EPR-800) inserted into the right atrium and ventricle in conjunction with surface ECG/EKG recordings. Surface ECG recordings we measured using subcutaneous electrodes connected to an Animal Bio amplifier and PowerLab. 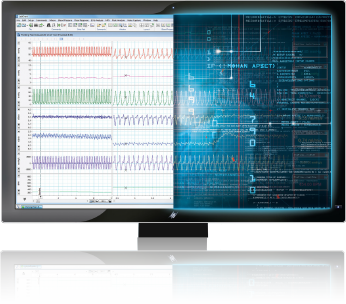 Data was later analyzed using the ECG module in LabChart Pro. This enabled the team to stimulate the heart in different ways and measure the subsequent effects on the electrical activity of the heart. Comparing results from the control and transgenic mice, they found that in the absence of Cx43, there was impaired AV node conduction, indicating that cardiac macrophages can influence the electrical conduction of the heart. 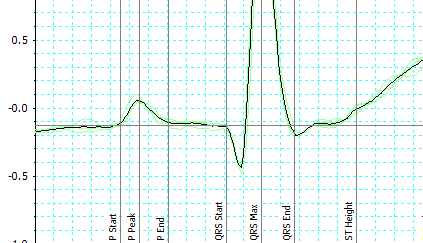 Simplified set up of a surface ECG recording. Signals are amplified using an Animal Bio Amp connected to a PowerLab and analyzed in LabChart. Next the team wanted to investigate if depleting the resident macrophage population would have a similar effect on AV-node conduction. They did this by genetically modifying mice to expressess a diphtheria toxin (DT) inducible system, that upon administration of DT, would result in the depletion of macrophages (and other myeloid cells). To monitor the subsequent effects on the heart, they used an implantable ECG telemetry device (DSI) placed in a lead II position within the abdomen. This enabled ECG data to be recorded continuously over 8 days. The data was later analyzed using LabChart software. Interestingly, within 24 hours of a single dose of DT, all mice had developed a first degree AV block, that overtime progressed to a third degree block. An AV-block happens when the conduction between the atria and ventricles is impaired. Clinically, AV-blocks can worsen pre-existing conditions such as heart failure. The unique integration of cardiac and immunological research techniques used in this study, has uncovered the unlikely role that macrophages play in facilitating electrical conduction in the heart and their potential involvement in heart disease. For years we have compartmentalized our bodies into distinct physiological systems, made up of different cell types that have distinct functions. However, it is through such studies like this that we are beginning to understand the amazing adaptability and cooperativity of these so called ‘distinct’ cell types, and discover how intertwined these systems really are. Interested in using some of the above techniques in your research? Nguyen KD, Qiu Y, Cui X, Goh YP, Mwangi J, David T, et al. Alternatively activated macrophages produce catecholamines to sustain adaptive thermogenesis. Nature. 2011;480:104-108. Theurl I, Hilgendorf I, Nairz M, Tymoszuk P, Haschka D, Asshoff M et al. On-demand erythrocyte disposal and iron recycling requires transient macrophages in the liver. Nat Med. 2016;22:945-951. Hulsmans M, Clauss S, Xiao L, Aguirre AD, King KR, Hanley A, et al. Macrophages facilitate electrical conduction in the heart. Cell. 2017;169:510-522.